Josh Peckler - Jpeckler@shawmedia.com Woodstock North's Ryan Wade (37) bounces off Sterling's Alex Soriano on his way to a touchdown run during the second quarter at Woodstock North Saturday, October 27, 2012. 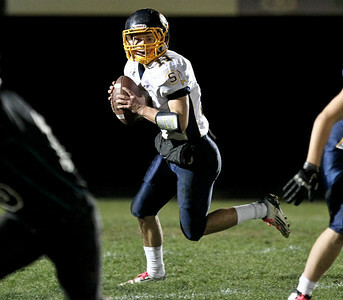 Woodstock North defeated visting Sterling 68-20 during their IHSA Class 5A first round playoff game. Josh Peckler - Jpeckler@shawmedia.com Woodstock North's Grant Wade (30) prepares to stiff arm Sterling's Temo Barron during a run in the first quarter at Woodstock North Saturday, October 27, 2012. 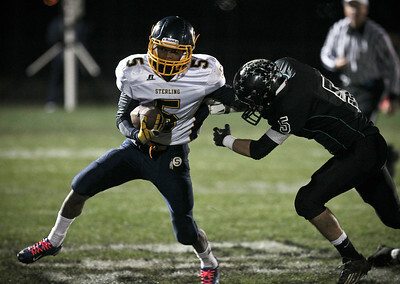 Woodstock North defeated visting Sterling 68-20 during their IHSA Class 5A first round playoff game. Josh Peckler - Jpeckler@shawmedia.com Woodstock North's Shane Zieman (28) is congratulated by teammate Grant Wade after Zieman scored on a touchdown pass during the second quarter at Woodstock North Saturday, October 27, 2012. 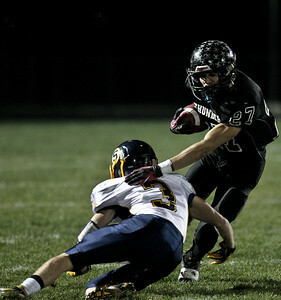 Woodstock North defeated visting Sterling 68-20 during their IHSA Class 5A first round playoff game. 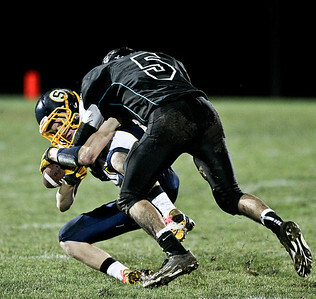 Josh Peckler - Jpeckler@shawmedia.com Sterling quarterback Tanner Morse is wrapped up by Woodstock North's Shane Zieman during first quarter at Woodstock North Saturday, October 27, 2012. 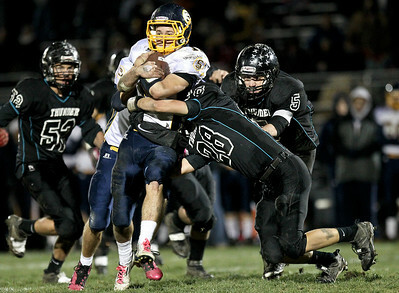 Woodstock North defeated visting Sterling 68-20 during their IHSA Class 5A first round playoff game. Josh Peckler - Jpeckler@shawmedia.com Sterling quarterback Tanner Morse looks down field for a open receiver during first quarter at Woodstock North Saturday, October 27, 2012. 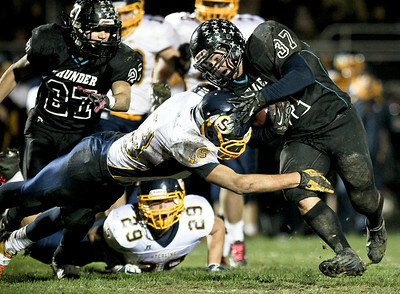 Woodstock North defeated visting Sterling 68-20 during their IHSA Class 5A first round playoff game. Josh Peckler - Jpeckler@shawmedia.com Sterling's Cornell Hartz tries to break away from Woodstock North's Jake Schnulle during the second quarter at Woodstock North Saturday, October 27, 2012. Woodstock North defeated visting Sterling 68-20 during their IHSA Class 5A first round playoff game. Josh Peckler - Jpeckler@shawmedia.com Woodstock North's Shane Zieman (28) tries to stay in bounds after receiving a pass while Sterling's Tanner Morse (11) tries to push him out during the second quarter at Woodstock North Saturday, October 27, 2012. Woodstock North defeated visting Sterling 68-20 during their IHSA Class 5A first round playoff game. Josh Peckler - Jpeckler@shawmedia.com Woodstock North's Jake Schnulle (5) lays a hit on Sterling's Logan Wharff during the second quarter at Woodstock North Saturday, October 27, 2012. Woodstock North defeated visting Sterling 68-20 during their IHSA Class 5A first round playoff game. Josh Peckler - Jpeckler@shawmedia.com Woodstock North's Adam Haimbaugh tries to avoid being tackled by Sterling's Logan Wharff during the first quarter at Woodstock North Saturday, October 27, 2012. Woodstock North defeated visting Sterling 68-20 during their IHSA Class 5A first round playoff game. Woodstock North's Shane Zieman (28) tries to stay in bounds after receiving a pass while Sterling's Tanner Morse (11) tries to push him out during the second quarter at Woodstock North Saturday, October 27, 2012. 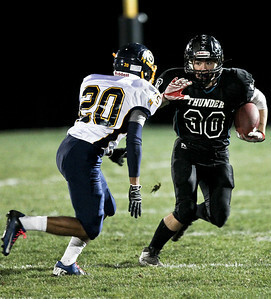 Woodstock North defeated visting Sterling 68-20 during their IHSA Class 5A first round playoff game.